outfit: fringed skirt and glitter boots. 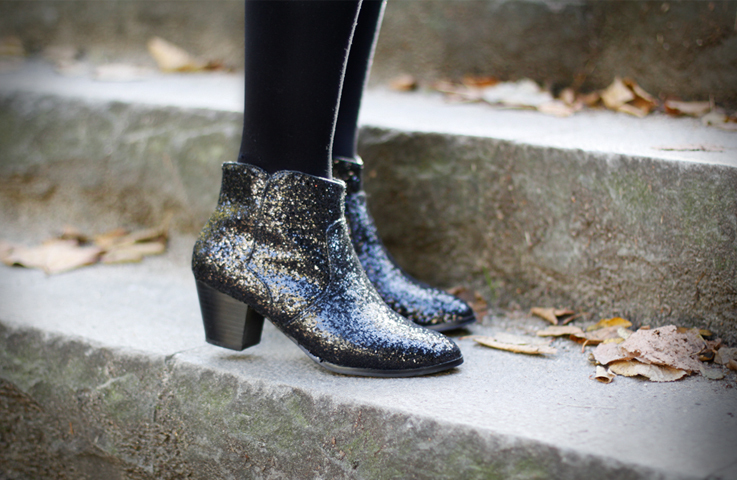 Can you believe that those glitter boots are from Primark and cost 12€ only? It is obvious that the design is a Giuseppe Zanotti copy, but whatever. I am very happy to have found them in my size. Yesterday the weather was really nice in Berlin, so I was able to leave the house without jacket. I wore my new sweater from Weekday for the first time. The grey-burgundy-mix is pretty awesome and I decided to combine it with glitter boots and a black jeans skirt with leather fringes in the front. Then again the accessories (bracelet, bag and beanie) are black again. how to wear: flower printed jeans. Nice outfit! Love the sweater!